You came downstairs today, earlier than I anticipated from quiet time, with paper in hand, eager to show me a picture you had drawn. And the joy in your face was more important than the fact that you had come downstairs far too early. Instead of sending you back upstairs until quiet time was officially over, I invited you to bring your new crayons downstairs to color with me. We sat, pulled out clean sheets of crisp paper, and spread the crayons before us. 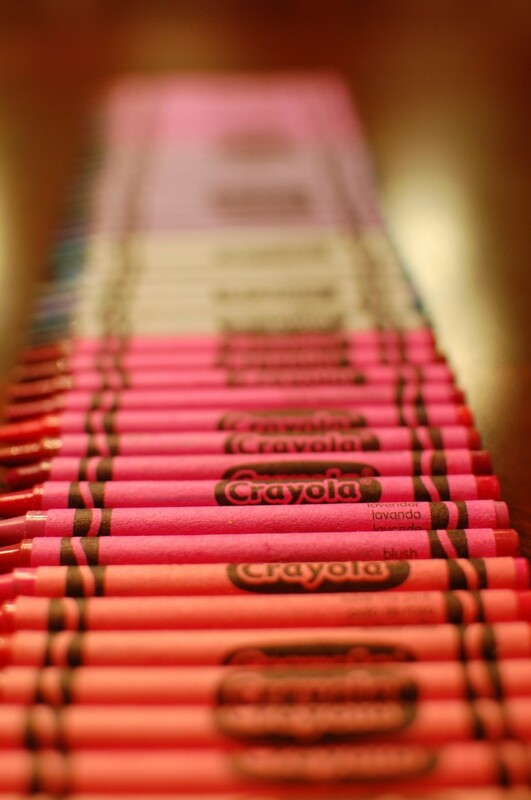 From a sea of colors, with each crayon you chose, you asked me to read you the names. Names that were more than just the words on the colored wrappers. Names that bring to mind stories that I will share with you one day. The color of my childhood home…a home that held tremendous sadness, but also immeasurable joy. The home in which I learned about trust, loss, love, and survival. The color of the profusely-blooming vine behind the house we lived in before you were born. Your daddy and I sat beneath those vines, on still summer nights, and dreamed of you. Daddy’s mommy’s favorite color. One day I will tell you about the rich velvets that she wore…cerulean, turquoise, violet. I will tell how those jewel tones mirrored the vibrancy of her soul. The color of the sea where Daddy and I were married. One day I will tell you how marrying Daddy brought me a peace that I’d never known before. I will tell you that in those moments, the fear that I had carried around for my entire life was washed away. The color of the Bleeding Heart plants that flanked my grandparents’ home…the home that held only happiness, acceptance, and love. The color of my grandfather’s tie…the length of silk with which he taught me the Windsor Knot…one of the many lessons taught to me by the man who stepped into the role of father when I lost my own. The color of my mother’s eyes. The eyes that reassured me that things would be okay. The eyes that have never let me down. One day, you’ll pull crayons out of a similar box for your children and they’ll look at you, waiting to hear your stories. May your pile of crayons be huge and colorful…and the stories you share, happy ones. Sometimes, I barely know how to comment on one of your posts because you take my breath away so infinitely, it feels like it won't return. How you can pull something so seemingly insignificant into a beautiful story…a beautiful memory…is breathtaking. What a heartwarming scene you just painted. I love the way you weaved the colors into such beautiful memories, Nichole. Your writing is breathtaking. What an amazing post! Your memories have drawn beautiful pictures on my heart. I adore this idea. I'm now thinking of the colors of my life, and how I will share them. Gorgeous writing. Oh, Nichole. What a beautiful post. I feel like I can SEE "asparagus and gold" eyes. So beautiful. I love these small moments wrapped up in colors- genius, lovely. Oh so amazing Nichole, I barely know what to say. Your talent is beyond words. So lovely, Nichole! It made me think I hope she is keeping a scrapbook of her blog posts. Because your pieces are so intimate, your daughter will love to hear about these stories about herself and these people one day! Stick in a few pictures and boom! Instant scrapbook! You know, because you have so much time to do that. That one wowed me. Amazing. The mother you are and the love you hold in your heart. Just wow, Nichole. So beautiful! You are an inspiration in so many ways. I'm truely speechless. Absolutely breathtaking. Beautiful! Your writing is simply amazing. Nothing I can say will truly capture the grace you have when sharing thee small moments. what a beautiful way to store your memories! Oh Nichole….so beautiful. 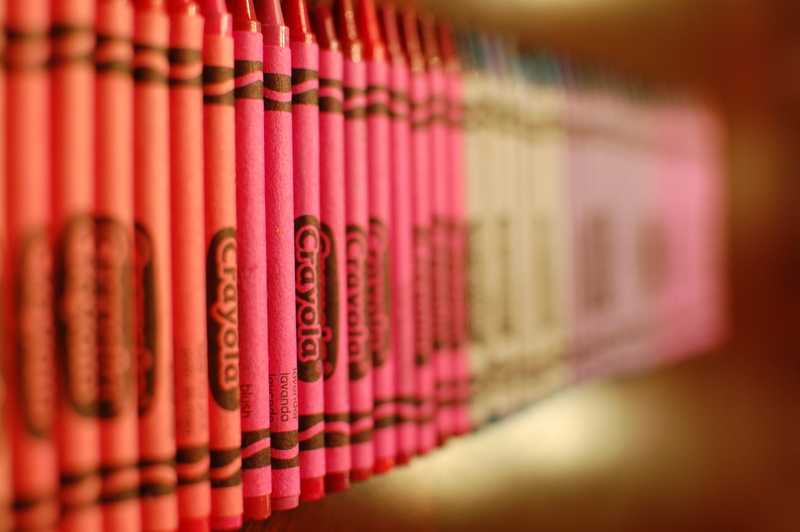 You've made me want to grab the box of crayons and color…and dream…and remember. This is so you, and I am so very glad this post made it out of your heart. The beauty of this just speaks to my soul. I have so many memories associated with colors as well. They way you wrote this TO her…. Thy way you wove it all together is just gorgeous Nichole. I'm in awe. Oh, Nichole. What color crayons will she select to represent her childhood? Which shade is for laughter and dancing? For beauty and love? For her parents and her brother? For hope? What a lovely rainbow Katie will be able to draw. All I can say is that your children are very, VERY fortunate to have you. A beautiful post! Wow, this post leaves me a little speechless. Who knew crayons could hold such a treasure of memories. *sigh* I just love the way you write. How you can put so much feeling into a color is amazing. LOVE IT! This is so sweet and brought tears to my eyes! So beautiful, Nichole. I had a post about crayon colours this week too. Very different though! But same love for the names. Amazing, breathtaking…now I need to go buy some new crayons!!! Oh, this is one of my favorite posts of yours for sure. She will treasure this! This made me smile. Such a beautiful and colorful life you have had and give to Kate and Matthew both. I saw this cross my Twitter deck today and am so glad I came over to read it. Just beautiful. Your words do something to me, Nichole…I can't even describe. They're lovely and dreamy and fill me with emotion. One of my favorite posts ever! I loved this post. I think I want to go color now. I don't have much to say, but I wanted to let you know that this took my breath away. I have always loved choosing colors with Abbey, and I will cherish those quiet moments even more after reading this. I'm always astounded at all the beauty you see in the everyday. Gorgeous post! I love what that unexpected coloring session with your daughter inspired in you. What a wonderful way you made of that opportunity, Nichole. You make me treasure even more those quiet moments with my children. You show a beautiful talent with words here. Lovely integration of colors into memories. Love the coloured memories. Love, love this post. This is so beautiful. Reading something like this gives me just a tiny glimmer of wanting to be a mother (I don't plan on having children). It truly is a relationship like none other. Absolutely loved your writing. This was so wonderfully evocative, thank you! It made me want to grab a box of crayons and daydream. Just beautiful. Wonderful imagery in a very tender thought. I hope your crayon wishes for her come true! This is one of the most amazing blog posts I've ever read.